Musa. 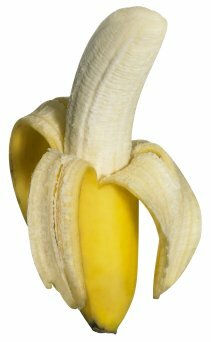 (From Arabic mauz, banana, or for Antonius Musa, physician to Octavius Augustus, first Roman emperor.) BANANA; PLANTAIN; MANILA HEMP. Musaceae. About 40 species of large, rhizomatous or stooling herbs, to 6m. Leaves large to gigantic, oblong or elliptic, entire but often tearing, pinnately parallel-veined, margin often red, spirally arranged, midrib with deep rounded groove above; sheaths tightly clasping, forming pseudostem. Inflorescence a terminal spike, pendulous or erect, peduncle often pubescent, emerging from centre of pseudostem; flowers in clusters subtended by coloured bracts, female or hermaphrodite at base, male toward apex of inflorescence; bracts often roll back to reveal flowers, in single or double ranks; tepals 2, one tubular and compound with 3 lobes and 2 accessory lobes, the other free and inserted, opposite; stamens 5, rarely 6; ovary inferior, trilocular with many ovules. Fruit a many-seeded berry, seeds subglobose, lenticular or cylindrical, less than 7mm in diameter, arrilate and black. Tropical Africa, Indian subcontinent, SE Asia, N Queensland. Some of the smaller ornamental species such as Musa auriantiaca, Musa uranoscopus and Musa velutina are suitable for the intermediate greenhouse in temperate regions where space allows, and are also valued as foliage and flowering plants for home and conservatory. Musa species grow extremely rapidly under favourable conditions and it is not uncommon that the larger species outgrow their allotted space by their second or third season from seed; the foliage is extremely attractive however, and Musa species are sufficiently easy to grow that they can be replaced regularly as necessary. In tropical and frost-free subtropical gardens Musa species are often grown for foliage effects, and in temperate regions, Musa basjoo is occasionally used as a dot plant in frost-tender bedding, overwintered in the cool glasshouse; they need a site with full protection from wind which quickly shreds the leaves. Of the larger species with edible fruits, Musa acuminata and Musa x paradisiaca are the most likely to succeed under glass, although they will require spacing of at least 2.4 x 2.4m and 3m of headroom, in the open border or in containers of at least 60cm diameter. Grow other species in the glasshouse border or in large tubs or pots in an open, freely draining, high-fertility, loam-based medium, pH 6-7.5. As ornamentals, Musa acuminata will grow with a minimum temperature of 10ºC, Musa velutina at 16ºC; any flowering and fruiting growths should be removed as they shrivel. For fruit production the optimal temperature is about 27ºC but, especially during the ripening stage, the night temperature should not fall much below 18ºC, since cooler conditions greatly impair fruit flavour and texture; surplus suckers should be removed frequently, root formation ceases as flowering begins and the number allowed to fruit is governed by available space at the root. The period between flowering and harvest will vary between 80 and 120 days, depending largely on temperatures (Musa fruits are always harvested green in commerce, ripened after transport in warmth and with ethylene treatment and high humidity). Each shoot bears one bunch of fruit and then dies, the perennial corm will then produce further suckers. Admit bright filtered light, maintain high humidity but with a bouyant atmosphere, ventilating where this is possible without a marked fall in temperature. Water plentifully and apply a liquid feed weekly when in full growth; water sparingly in winter. Propagate by seed in spring, germinate at 21ºC, or by division of suckers with a portion of rhizome. Pseudostems to 7m or more, green blotched brown or black. Rhizome short. Leaves erect or ascending to 3 x 0.7m, rounded at base, green sometimes dark-flecked above, green or purple beneath; sheath upper edge with papery margin. Inflorescence pendulous; peduncle brown-pubescence; bracts acute, grooved, exterior bright red to purple or yellow, interior paler; female flowers in 2 rows in each lower bract; terminal male bud acute. Fruit to 12 x 2.5cm, glabrous bright yellow, pulp white to yellow; seeds angular, depressed. Flowering irregular. SE Asia, N Queensland. ‘African Rhino Horn’: slender plant, fruit to 60cm long. ‘Dwarf Orinoco’ and ‘Orinoco’ (‘Bluggoe’): fruit very thick with pink-tinted flesh. ‘Manzano’ (‘Silk’): plump short fruit of dessert quality when ripe. ‘Mysore’: tall, disease-resistant, fruit medium-sized, dessert quality when ripe. ‘Puerto Rican Dwarf’: short plant, fruit vary large in small bunches. Z9. Pseudostems many, closely grouped, to 3m. Inflorescence erect; bracts red or yellow; flowers bright yellow. Fruit green. Assam. Z9. Pseudostems clustered, to 7m and 28cm diameter, green or yellow-green. Rhizome short. Leaves to 3m, green, glaucous beneath; sheath waxy. Inflorescence pendulous; peduncle glabrous; female flowers clustered; male bud obtuse; bracts obtuse, grooved, exterior purple, crimson inside; male flowers in 2 rows, to 20 per bract. 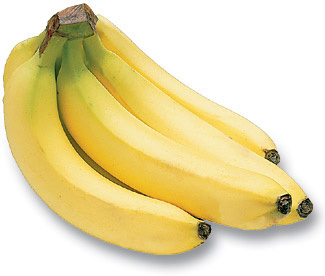 Fruit to 10 x 3cm, pale yellow, indehiscent, pulp cream; seeds subglobose. Indian subcontinent, S China, Philippines, New Guinea. Z10. 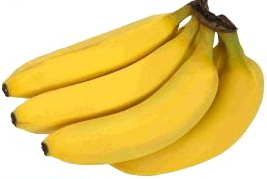 JAPANESE BANANA. To 5m, stoloniferous; pseudostem green, waxless, glabrous. Leaves 2m x 70cm, oblong-lanceolate, thin, bright green; petiole stout, to 30cm. Inflorescence horizontal to pendulous; peduncle downy; bracts grooved, downy, outside yellow-green or tinged brown, inside pale yellow, biseriate; male flowers about 20 per bract. Fruit sessile, to 6 x 2.5cm, yellow-green with white pulp; seeds black, compressed. Japan, Ryuku Islands ‘Variegata’: leaves banded or flecked lime green, cream and white. Z8. To 1.5m, stoloniferous; pseudostem slender, about 70cm, tinged or blotched black. Leaves about 80 x 20cm, oblong. Inflorescence erect, to 14cm; bracts red-purple, slightly grooved; flowers yellow, female flowers in clusters of 3. Fruit green, small. Spring. NE India. Z9. FLOWERING BANANA. Stem slender, 2-3m, glaucous, waxy green. Leaves to 2m x 35cm, slightly glaucous, sheath margins adpressed to stems. Inflorescence erect; flowers orange-yellow, in single row; male bud slender; bracts pale purple, grooved, occasionally slightly revolute. Fruit about 6 x 2cm, yellow; seeds black, angular depressed, 5mm. Flowering irregular. Bangladesh, Burma. Z10. (Musa acuminata x Musa balbisiana.) EDIBLE BANANA; FRENCH PLANTAIN. To 8m, stoloniferous; pseudostem terete, 14cm diameter at base. Leaves to 2.5m x 70cm, oblong, green. Inflorescence pendulous, to 1.5m. Fruit usually seedless, often yellow, pulp white. Tropics. Z9. 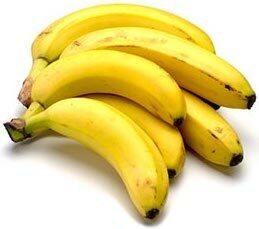 There may be as many as 300 cultivars of edible banana worldwide. The leading commercial cultivar was for a century ‘Gros Michel’ (‘Bluefields’) now being phased out owing to suscepibility to destructive Panama disease. It has largely been replaced by Cavendish cultivars. 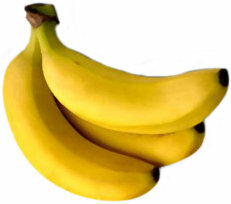 Recommended cultivars of dessert bananas (Musa x paradisiacum and Musa troglodytarum) include ‘Cocos’: medium-height, short fruit. ‘Dwarf Cavendish’ (‘Basrai’): short plant, fruit medium-length. ‘Dwarf Jamaican Red’ and ‘Jamaican Red’: fruit purple-red till ripe. ‘Giant Cavendish’ (‘Grande Naine’): tall, large fruit rounded, flesh pink-tinged. ‘Ice Cream’ (‘Blue Java’): medium-sized plant, fruit stout, medium-sized. ‘Koae’: leaves striped laterally white and pale green on dark green, young fruit variegated, later yellow. ‘Lacatan’: very tall, fruit medium-sized in large bunches. ‘Lady Finger’: tall plant, fruit small, sweet. ‘Valery’: semi-dwarf, fruit long, in large bunches. ‘Vittata’: leaves variegated pale green and white, midrib white, edged red. Similar to Musa uranoscopus except pseudostem to 1.5m, slender; leaves to 90 x 15cm; inflorescence and rachis red; bracts strongly revolute; peduncle pubescent; flowers yellow to green-yellow, spotted red. NE India. Z9. MANILA HEMP; ABACA. Pseudostems to 6m, clumped, green to purple-green. Stoloniferous. Leaves to 2m, glabrous, oblong, basally deltoid, bright green, often spotted above, glaucous beneath, conspicuously veined; petiole to 30cm, sheathing. Inflorescence a horizontal to pendulous spike; flowers biseriate; pedicel short; outer sepals bearing horns; male bracts persistent, polished, revolute, outside red to purple, inside paler. Fruit indehiscent, glabrous, to 7cm; seeds subglobose, black, dorsiventrally compressed. Philippines. Z9. FE’I BANANA. Confused names encompassing a range of seedless and seeded cultigens grown throughout Polynesia and Melanesia, notably cultivars Aiuri, Borabora, Rureva and Soaga. Pseudostems to 7m, clumped, dark green, becoming maroon or violet-blue at base or wherever cut. Leaves to 4 x 3m, sap green, sometimes stained or flushed violet to maroon. Inflorescence erect; female flowers to 12 per cluster; male flowers ivory tinted maroon, to 4 per bract; bracts glabrous green. Fruit to 14cm, orange-brown, pulp sour unless cooked. Distribution described originally as Sumatra for Musa troglodytarum and Tahiti for Musa fehi. Z10. Pseudostem to 1m, terete, glossy red-green, becoming papery with age. Leaves to 75 x 30cm, oval to elliptic, abruptly acute, glossy light green above, somewhat waxy beneath, conspicuously pinnately veined, midrib green to rose-pink, sunken above, prominent below. Inflorescence to 75cm, erect; bracts magenta to scarlet, to 15 x 8cm, fleshy, barely reflexed or revolute, often tipped green, persistent, shiny; flowers 2 per bract. Fruit oblong to cylindric, to 5 x 2.5cm, rose-pink to green, downy, later yellow-brown; seeds spherical, black. Indochina. Z10. Pseudostems to 1.5m, yellow-green to purple-green; rhizome short. Leaves to 1m, dark green above, paler with red midrib beneath, venation conspicuously pinnate. Inflorescence erect; peduncle pubescent, white; flowers bisexual, in monoseriate clusters; male bud acute to acuminate; bracts not grooved, outside purple-haired, inside darker. Fruit to 9 x 3cm, pink, pubescent, indehiscent, pulp white; seeds black, to 5mm. Flowering irregular. NE India. Z9.